BioTek Instruments, Inc., is a global leader in the development, manufacture and sale of microplate instrumentation and software used to aid in the advancement of life science research and to facilitate the drug discovery process. Our instrumentation provides rapid and cost-effective analysis to enable sensitive and accurate quantification of a wide range of molecules across diverse applications. We’d all like to think we’re superheroes, capable of juggling 20 experiments at once – but the truth is, sometimes we need a bit of help. If you have multiple imaging requirements, including color, fluorescence, brightfield and phase contrast, or you perform many types of cell-based assays, then the Cytation™ 5 Cell Imaging Multi-Mode Reader from BioTek gives you the help your lab needs. Cytation 5 is both an automated digital widefield microscope and a conventional multi-mode microplate reader. It can replace multiple instruments in your laboratory, saving you time, money, space and stress. It’s a fact of scientific research that lab projects are rarely predictable. Assays quickly beget more assays and before you know it, you have a plethora of imaging and quantitation needs. To meet these needs, you’d typically have to purchase several instruments, or quickly make friends with lots of equipped researchers! But with the Cytation 5 you can do it all in your own lab with an automated and intuitive platform, and for a reasonable price. Cytation 5 is similar to a conventional microplate reader. It can read whole-sample fluorescence, luminescence, and absorbance with unmatched versatility and performance. Its unique Hybrid Technology™ combines variable bandwidth monochromator optics and high-sensitivity filter-based optics. Additionally, Cytation 5 can incubate up to 65 °C, shake, control CO2/O2 and is available with dual reagent injectors. Cytation 5 has a 16-bit monochrome Sony CCD camera with options for automated focus and exposure. Numerous imaging filter cubes are available to accommodate a wide variety of fluorophores. It has a 6-objective turret, and available objectives range from 1.25X to 60X. You can even change objectives mid-assay if desired. 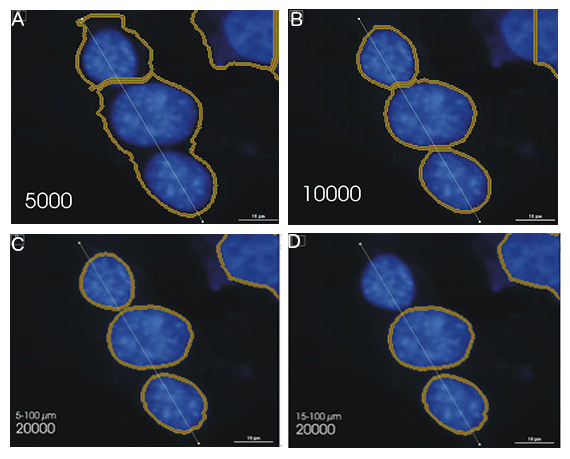 Figure 1: Images of PtK2 cells undergoing mitosis taken on Cytation 5. Staining: Tubulin (green), actin (red) and nuclei (blue). A) Imaged at 20X magnification; B) imaged at 60X magnification and; C) Imaged at 60X magnification. Live cell imaging has been steadily gaining popularity, as it is a more relevant way to assess cellular phenotypes and functions. However, live cell imaging is not without its challenges – to keep cells alive you must provide a nurturing environment. BioTek’s Cytation 5 is well suited for live cell assays, with temperature and CO2/O2 control within the detection chamber, along with both linear and orbital shaking. 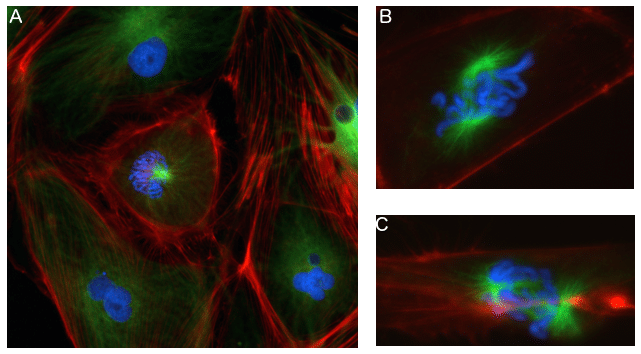 The automated stage, autofocus and autoexposure are time-saving features for live cell imaging. This controlled environment allows live cell assays to be run over a period of several days. The video below shows a HeLa cell proliferation assay that was performed over 50 hours, showing that the Cytation 5 is perfectly equipped for such long-term assays. Cytation 5 also provides precise control over the timeframe of your imaging. From 10 frames per second to seconds per image you can assess quick kinetic reactions within your cells, or create time-lapses. Live cells are considered to be more predictive when grown in a 3D matrix. But imaging cells grown in 3D, opposed to 2D, can be a challenge without the right equipment. Cytation 5 allows you to monitor 3D cell culture assays kinetically, including single spheroids comprised of hundreds to thousands of cells. Figure 2: 3D imaging of liver microtissues using a 10X microscope objective after 10 days of treatment with various doses of diclofenac. Blue represents live cells; green, dead cells. Scale bar in bottom left corner represents 200 microns. 1) Auto-count organelles such as mitochondria and autophagosomes. 2) Quantify cell phases. By defining thresholds you can automate the counting of cells in G1 and G2. 3) Quantify cell migration/invasion assays. By defining regions of interest you can easily quantify cell migration and invasion. 4) Quantify Phenotypes. It’s possible to observe how your compound of interest affects the size, shape, area or intensity of your cells with Cytation 5. Figure 3: Gen5™ software allows you to tweak the threshold of intensity (A and B) and size (C and D) to ensure high accuracy no matter what cells you are counting. Scale bar in bottom right corner in each image represents 10 microns. Cell counting can be automated for one slide or dozens, or microplates with up to 384 wells. The ability to count your cells and measure confluence also means you can determine confluence over time or cell proliferation, and with Gen5 software you can generate growth curves and IC50s. The color brightfield imaging mode is perfect for imaging and analyzing histology samples, as the monochrome camera and sequential red-green-blue LED illumination makes it particularly well suited for H&E imaging. This setup provides a higher resolution final image compared to the color camera, and is lower in cost than multi-camera systems. You can even automate your H&E slide scanning with a 20-slide stacker. Have a sample with poor contrast? Visualize it using Cytation 5’s phase contrast imaging mode, which allows magnification from 4X to 40X. Cytation 5 is a versatile, easy-to-use imaging and multi-mode microplate reading system. It is the latest by BioTek, adding notable features including a joystick controller, high capacity turret and advance image processing and analysis. The Gen5 Image+ analysis software can cope with all of your analysis needs, including Z-stacking, Z-projection and deconvolution. Cytation 5 Cell Imaging Reader is sure to meet the diverse imaging needs of your laboratory, saving you time, money and hassle by replacing a variety of traditional imaging systems. Also, maybe most importantly, it is affordable. Thinking this sounds too good to be true? Why not contact BioTek and arrange a demo to show you how Cytation 5 can help you.